Horror still clutches my heart like an apparition from beyond the grave. “It is over,” Kenyan President Kenyatta assured the world on Tuesday. Some of the perpetrators are dead. Hopefully the rest are amongst eleven people detained in a sweep of Kenya’s exit points. And yet the echoes of their evil acts reverberate long after they are gone. Their shadows fall across the child who will never sing again, over children who will yet sing while glancing over their shoulders in fear. I can’t quite shake the feeling that it could have been me. When I set foot in 2010 on the slick, shiny tile of Westgate’s corridors , the mud from Mathare Valley still clung to the soles of my shoes. How shocking the contrast of sleek modern design to the sagging, rusty corrugated roof-line we just left behind. My Short Term Mission (STM) co-leaders and I carefully designed the schedule for the day – morning worship in Nairobi’s second largest slum alongside those we came to love during a previous week of service, a seemingly random drive past embassies and elaborate homes, and a casual stop at a mall for the stated reason of allowing team members to access ATMs. Secretly, we carefully calculated the twelve-mile drive to induce reverse culture shock. You see, when a person enters another culture and fully embraces the experience, returning to one’s own culture can strike heavy and hard. One day a person holds children who are sick, unloved, and starving. Several days later he or she stands in a crowded Wal-Mart, staring at abundantly stocked shelves and listening to a child cry for yet another toy. Returning STM members often experience overwhelming feelings of confusion and disorientation. According to Linda Olsen in her debrief guide called Towards Growthful Re-Entry, those returning from STMs respond in one of three ways: assimilation, alienation, or integration. They might set aside their cross-cultural experience as if it never happened and settle back into old patterns in their familiar home. They may overflow with frustration and lash out at their home culture for not understanding. But for those who successfully navigate what can become truly transformational, they meld their experiences into an entirely new way of seeing and being. Our desire as leaders was to provoke this reaction in our team members while we were still together. The mall was intended to test preliminarily, while still in Kenya, what each person’s intrinsic response might be, and then to process and support one another in anticipation of returning home. As team members stepped onto that glossy tile, some glanced around bewildered, as if they might turn and flee. Some looked relieved. Others wandered without purpose, disoriented, not quite believing that this glittering ode-to-consumption could truly be located in such close proximity to abject poverty. I remember checking in on three women, perched along the outer perimeter of a cafe, sipping, talking and laughing. They were carefree, as unsuspecting as any other person who visited Westgate last weekend. After this short experiment, we gathered our team members from Westgate’s cavernous halls and departed. Later we would process together. You see, it could have been me. I’ve been checking news-reports obsessively. I feel paralyzed as I try to assimilate this tragedy into my worldview where wickedness can mutate so uncontained. Make no mistake, evil is that evil. The people who perpetrated this unspeakable horror were under the sway of something much larger than themselves. Thank God I’ve never seen this kind of malignancy overtly in the eyes of a killer looking directly into mine, but certainly I saw its traces in the eyes of a two-year-old orphan, Sarah. 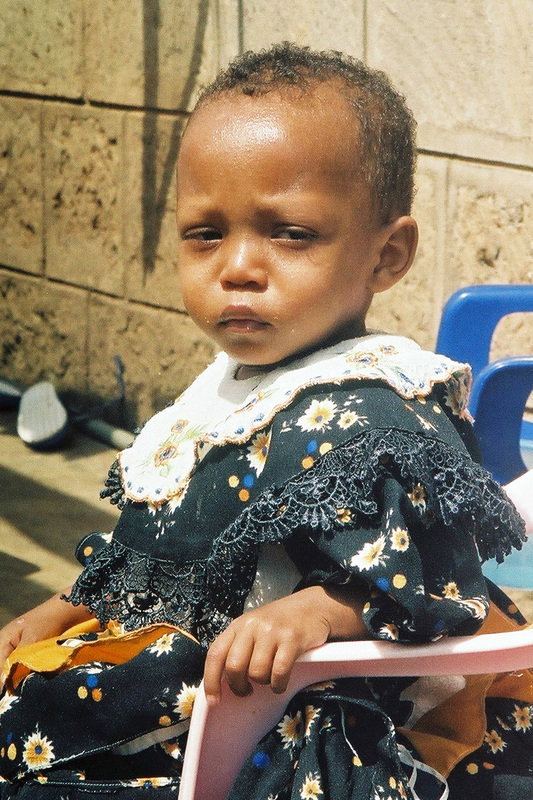 Betrayed by all who should have arisen to protect her and declare her beloved, she was abandoned to an orphanage in Kenya and left to die. Ostracized at that first institution because of her HIV+ status, her physical and mental health rapidly deteriorated. In a final act of rejection, she was off-loaded to a Mother Teresa orphanage, the last stop for children whom no one else wants. The gentle sisters there will never turn away a child in need, no matter how their cribs overflow. Sarah, 2004. Photo by Debbie Lee. I met Sarah there, sick and wilting, on an STM in 2004. Although we tried our best to elicit a response, she remained flat and turned utterly inward for several days. At last, her first smile emerged. Until then, I saw only the shadow of evil in the reflecting pool of her hollow brown eyes. I saw one mirrored there, so malevolent that he chose the weakest and most vulnerable to destroy, a child with no resources internal or external to fight back. In the force that strove to destroy Sarah’s soul as well as her body, I felt I came face-to-face with evil. This evil knows no mercy. It is the same source that swarmed and overtook hearts of people who became animals in its ruthless grip, unable to feel compassion for children attending a cooking exhibition, shooting at will regardless of age or innocence of their victim. It could have been me. It could have been my children. In 2005, during a long unexpected sojourn while adopting our youngest daughter from the same Mother Teresa orphanage in Kenya where I met Sarah, my children and I lived for the last six weeks of 7 months at an apartment complex located 500 meters from where Westgate now stands. The shopping complex was built six years ago, so it was only an idea in someone’s mind at the time we lived in the area. Instead of Westgate, my four children, ages 2-8, and I walked almost daily to the Nakumatt at Sarit Centre, an older shopping mall nearby. We lacked transportation except for a terribly-expensive-hired-car, so we accessed nearby places for ordinary needs. We gathered our daily food, balanced sacks in multiple hands, and trekked back to our temporary home. Surely if Westgate had existed at the time, we would have explored its environs well, whether for grocery shopping or simply a change of scenery from our little apartment and compound. I can see us, in my mind’s eye, a rag-tag little group wandering the aisles of Westgate’s Nakumatt in search of lentils, tea, or Fanta. Various friends of ours have visited Westgate since then. As recently as two weeks ago, former colleagues from CO enjoyed a snack in one of its cafes. When we realize our common humanity in every tragedy or hardship upon this globe, when we see clearly that “but for grace go I”, we encounter a choice. Just like the 2010 STM team stepping into the sunlight from the halls of Westgate – we either pretend we don’t know what we know; we become host to the same anger that fuels hatred and ultimately evil; or we integrate. We allow the suffering of others to intersect our life and change us. We choose to step into the space where it could have been us or those we love. We must hesitate there but for a moment, lest the malignancy overwhelm us. Then, we step boldly through to the other side, empowered to become part of the change. Honestly I’m not really sure what I mean when I say that. I know only that I long to take my stand against the evil I have seen and heard about, and instead to stake my claim with all that is right and just and beautiful. To do whatever I can to usher that Presence into the hearts of people around the world who desperately need to know they are not alone. That evil will not and cannot win. Evil may have had its say for a moment at Westgate, in ways more shocking and horrific than normal citizens could ever imagine; but it can never be the final voice. Not if each one of us sees the suffering of fellow humans around the world and says, “It could have been me.” Not if each of us allows that truth to propel us to action, however small and seemingly insignificant, as God leads. By the grace of God, let it be me. Oh…how I echo your heart. I revisit my memories of the mall and everything inside me tightens up. I feel like shouting in frustration one moment and crying in the next. My first thought was….Are any of my Kenyon friends among the hurt or dead? Then I remember that they probably have never been to the mall….a blessing or not? I received a very welcome text from the Karaus after it first happened that they were all safe. It’s been very emotional for me, too. Yes – come Lord Jesus come. Amen. I am reminded today of His words, “In this world you will have trouble. But take heart! I have overcome (past tense) the world.” We see evil seem to win a battle, and we tremble. But we have to remember, the war has already been won. Thank you Emily, for being a person of courage! I hope and pray that your friends’ relatives are okay. The depth of evil in this incident is shocking. I pray that the Light becomes ever brighter in this darkness. I know God can use each one of us if we have the courage to step forward, as you are doing.